Those goats make me happy. What a great, big, open space! Yay! A happy post where something gets saved, used, survives. If I were still in the area, I'd make a point of buying his goat cheese just on principle! I'd like to throw an idea out into the blogosphere. It seems we must always fight tooth and nail for things like open space and historic preservation, constantly defending them against things which nobody really wants but which seem to spring up almost of their own will (parking lots, car dealerships, strip malls, greytowns...). The reason for this, I think, is that our system essentially demands that any substantial piece of land must generate revenue for its owner (...in order to pay taxes and insurance on structures whose "value" is constantly increasing, regardless of the actual income of its occupants or the actual state of repair of said structures -- and especially regardless of how attractive the property might be in various different conditions, such as farmed, developed, paved...). My idea: There needs to be some kind of counteractive incentive for property which contributes to the common good, as opposed to property which mainly turns a profit for its owners (and which is often an eyesore and a burden on the local community in direct proportion to the amount of profit generated). Call it an "ugly tax" for short -- which is a little misleading, because it would be a tax reduction for many owners (depending on how the current tax codes handle commercial vs. private property)... and it would probably involve more than just re-thinking tax codes; there's the property insurance angle, and probably other things I'm not thinking of. We're probably not ready as a society to seriously start advocating something like this (and a lot of research is needed before we could come up with a sane reform plan), but it would seem like a good thing to be pushing towards in the long run, and perhaps a good principle to use as a reference for "how things should be". And maybe now, when the huge profits from "property investment" have been revealed as mostly a bubble, is a good time to start thinking about things like this. I know the real-estate lobby would never stand for anything like this because it would probably cut deeply into profits, being a fundamental shift in the way real estate is handled -- and therein lies the problem. Thanks for keeping an eye on the history in our neck of the woods! My mother was Carolyn Hampton Spann; her grandfather was William Beamis Hampton (“WB Hampton”) on these maps. My honey and I moved back to Durham 3 years ago and bought a 97-acre farm on Bahama & Hampton Roads – the old Florida Hampton Umstead house listed in the Inventory. We’re just a hop skip from where WB used to be. We started restoring the house – on hold until the economy improves and I can sell my New York place. Meanwhile, we’ve been transforming the old tobacco farm into a goat dairy, Prodigal Farm. The farm still has the old log curing barns, the pack house, the smoke house, the corn crib, and the mule barn (even much of the tack; the former owners farmed with mules until the 1960’s). You’ll have to come out in April or May, when the dairy’s all done and baby goats are hopping around! We met briefly at the Indy Citizen Award lunch last year. Woozle – thanks for your interest in preservation incentives! I’m chair of Durham’s Farmland Protection Advisory Board, and spend a lot of time working on these issues. For preserving farmland, there are a few government programs that help. First, folks who are farming at least 10 acres (or at least 20 acres of forest or 5 acres horticulture) can benefit from the “present use value” property taxation rate – which is much lower than the normal tax rate. Second, folks who want to preserve their farms as farmland forever can sell or donate a “conservation easement” on their farm. There are great local, state and federal programs that help fund this, though there’s never enough. And in this year’s economic climate, we hear that the Durham County funding for this program is likely to suffer a severe cut – if you agree this is important, write the County Commissioners and Manager and voice your support to keep this program funded! As for funding incentives for the common good, I agree, especially where, with farmland preservation in Durham, it coincides with preserving the watersheds for our drinking water supply. Lots of interesting ideas out there for this . . . but challenging in this economic climate to start a new program. 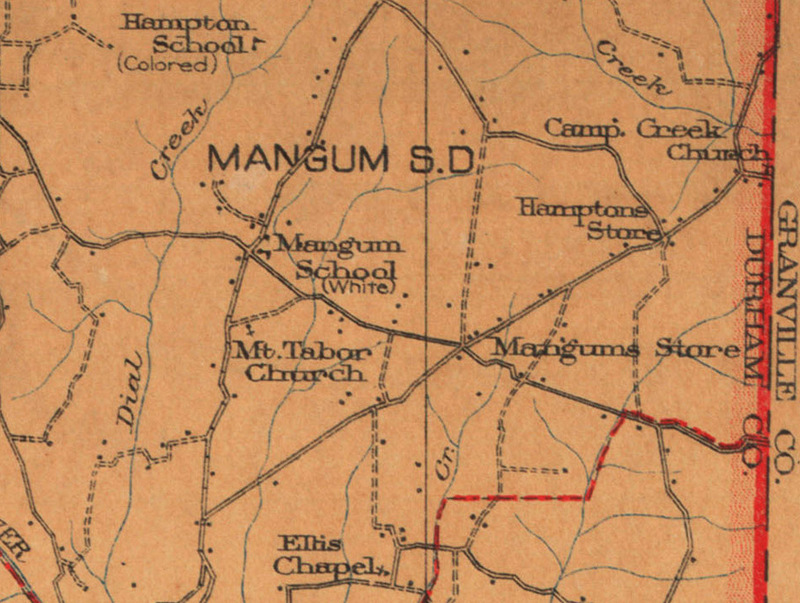 Mangums's Corner, 1914, marked with "Store" to the right of the marking for Mt. Tabor Church. 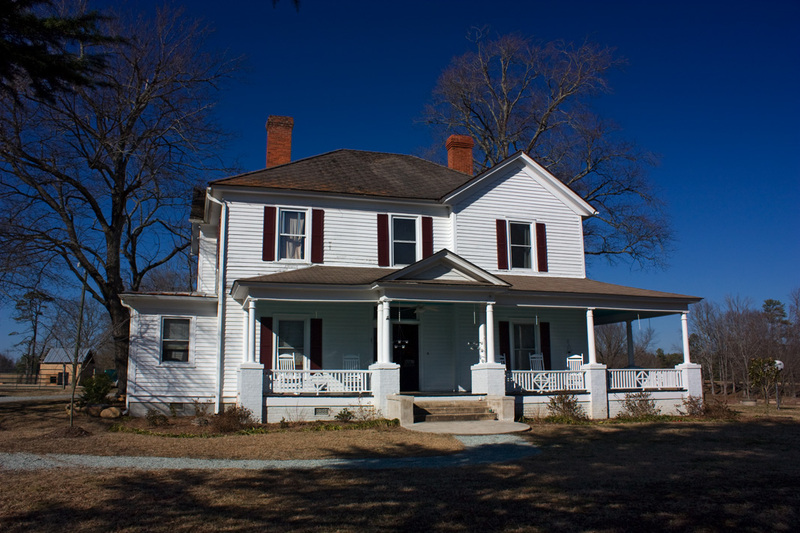 Sam T. Mangum built his home and store at the crossroads of Hampton Road and Hall Road between 1900 and 1914. He located his store on the southeast corner and built his house on the northeast corner. The house was built as an impressive frame Victorian structure, not atypical for farmstead dwellings, but certainly more embellished with irregular roofline, wrap-around porch and other Queen Anne details than some of the period. The early frame store on the southeast corner was evidently destroyed by fire in the 1920s or early 1930s; it was replaced with a brick structure, typical of city gas station/stores of the 1930s, with a protruding overhang supported by brick columns, but a bit fancier than most 'country' stores of this type during the period. Behind the house are an impressive array of tobacco barns, a pack house, a stock barn, and a smokehouse, and along the road across from the store, two large storage barns. 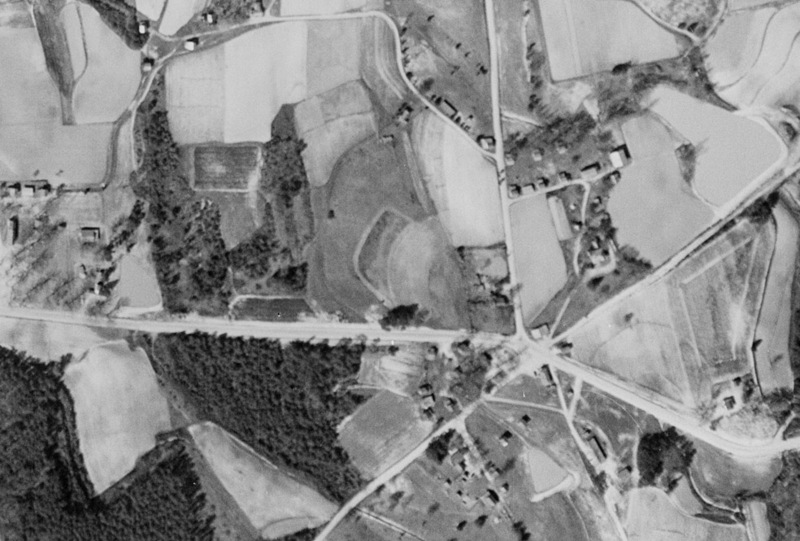 Sometime in the 1960s, Hall Road extending to the northeast was closed, and this became part of the Mangum farmstead - you can still see the line of the road on the present-day satellite map. 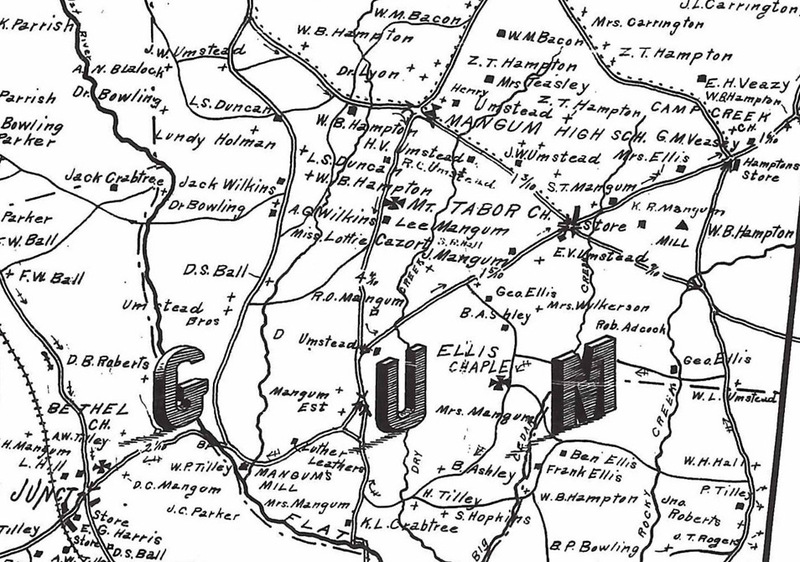 Dunwoody Road, marked with a dotted line in the above 1920s map, became the primary road to the north past the store and Mangum home. I don't know when Mangum's store went out of business; since 2003 the Mangum homestead has been home to Dave Artigues and his business, Elodie Farms. Dave is a regular at the Durham Farmers' Market with his goat cheese. The old tobacco barns where Dave makes cheese now. This seems as good a time as any to make the point that preservation of our existing building stock and wise redevelopment of our urban spaces - unused surface parking lots, old strip shopping centers, etc. - is about more than just preservation of our urban fabric, and creation of a walkable, human-scale in-town environment. It is just as much about preservation of open space, farmland, watersheds etc. There are, of course, direct methods for preserving farmland, forest, and the like, but the natural compliment to these efforts is the re-use of vacant houses and buildings and infill development on vacant land downtown. 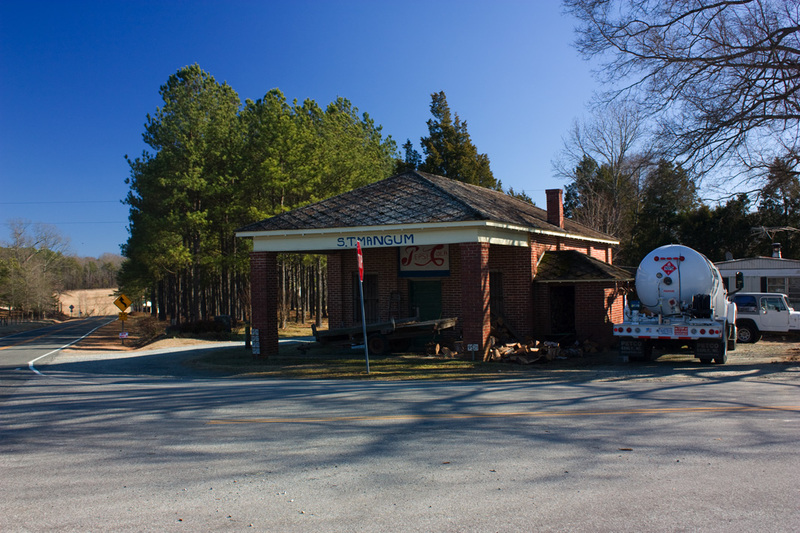 Northern Durham county is a beautiful place, and I'd very much like to see it retain this character. Those goats make me happy.